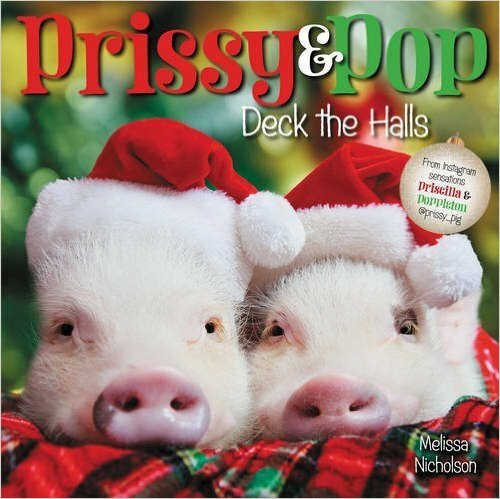 Deck the halls with Instagram sensations Prissy and Pop (@prissy_pig) in their second photographic picture book adventure! Our two favorite piggies, Prissy and Pop, are back with a Christmas book! I didn’t have an Instagram account until the end of 2015 and it was only because of a fun online contest I had joined. Check out my past review to catch up on the duo, but in the interim, Prissy and Pop are first grade class pet piggies of a first grade teacher who happens to own these two little mini-pigs that she prominently features on their own Instagram account (@prissy_pig). This is her second book from HarperCollins children’s books featuring the pair! WOW! Not only that, they have their own Gund plush dolls, and they seem to have unlimited mini-pig clothes from their owner, Melissa Nicholson. I must be in the wrong business because Prissy and Pop are sure living high on the hog. Prissy & Pop: Big Day Out became an instant favorite book in our house by both Brooke and Brie. We are now huge fans and followers (of which they now have over 600K) of these two Instagram sensations and I am happy to say that the two have expanded their family after adopting the two piggy’s niece and nephew! The adorable mini-pigs and Instagram sensations Priscilla and Poppleton (or Prissy and Pop for short) are now preparing for Christmastime, and are so excited for Santa’s arrival. You see adorable photos of the piggies trimming the tree, baking cookies, and singing carols. But wait—how is Santa supposed to know where they live? Will they have a merry piggie Christmas after all? About Prissy and Pop: Prissy was born in April 2013 and her first grade teacher human friend adopted her from a pig farm in Alabama. Melissa had so much fun dressing up and babying her little Prissy and sharing her with her first grade students that she ended up adopting Pop soon after. Melissa says that at the encouragement of her niece she started an Instagram account for the piggies and, let’s just say the two little hams have become quite successful. What I love the most about this true story is that Melissa often integrates her mini-pigs into her first grade classroom curricula at her Ponte Vendra Beach, Florida school and her students learn a lot about respecting animals on top of sharing their class with Prissy & Pop. Here I thought it was super cool that my daughter Brooke has a tarantula as her classroom pet!